Note: Except as noted for the cerci, all characters apply to both sexes. distribution Eastern half of the state only; throughout the Coastal Plain, and in the Piedmont west to Caswell, Orange, Chatham, Moore, and Richmond counties. A photo record from Burke County was most unusual and well to the west of the expected range. It should not be assumed to occur throughout the Piedmont based on this single "out-of-range" record. abundance Uncommon in the southern and central Coastal Plain, but rare in the northern third of the province. Rare to locally uncommon in the eastern Piedmont west to Orange County. Essentially absent in the western two-thirds of the Piedmont (despite the single record). flight Spring into early summer only. In the Coastal Plain, the flight is mainly from early April (very rarely in late March) to late June, sparingly into July. In the Piedmont, the flight occurs from early April to late June. The peak is from mid-April to early May. habitat Typically in and near swamps, but also along nearby rivers and streams. behavior Forages typically singly along wooded roads and openings near swamps and rivers, not over the water. 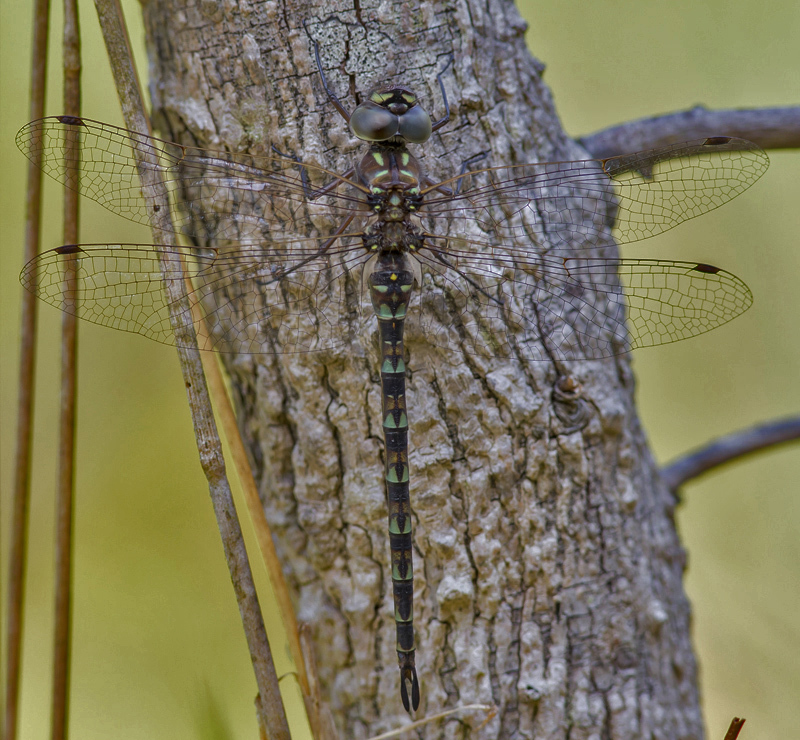 As with the Harlequin Darner, it often perches vertically on tree trunks, where it can be photographed near human eye-level. comments The species looks similar to Harlequin Darner, though has less green spots on the abdomen. Whereas the latter has a somewhat similar range and flight period to Taper-tailed, it is much more often encountered. There were few recent observations until about two years ago, probably owing to better coverage of the Coastal Plain. Comment: Moore; C, 2018-06-03, WEWO - Brought up to V.C. by visitor - was unable to fly. Comment: Orange, 2017-04-26, Eno River State Park (ENRI), Fews Ford Section near the main parking area. - Female; netted, photographed and released. Comment: Tyrrell, 2013-05-10, - Seen just after dawn, perched on a pine trunk. Comment: Carteret, 2004-05-30. FOMA - North winds most likely blew specimen from mainland.